One of the reasons we stayed at a hotel at the airport was that we had an early morning flight to Cairns (which is pronounced more like Cannes). It was so nice to wake up not as early and walk across the skywalk to the airport. We arrived in Cairns with signs everywhere for Ironman Cairns! I saw that they even had a mini triathlon and it made me wish (for a second) we’d still be here on Sunday so I could participate (or spectate). But Cairns? Isn’t the title of this post Port Douglas? Why, yes it is! Port Douglas is about an hour north of Cairns. In reading about the different places, Port Douglas sounded a little more what we were looking for (beach, closer to the Great Barrier Reef, laid back). We arrived at our hotel and immediately noticed the change in weather. Goodbye jacket! Hello humidity! 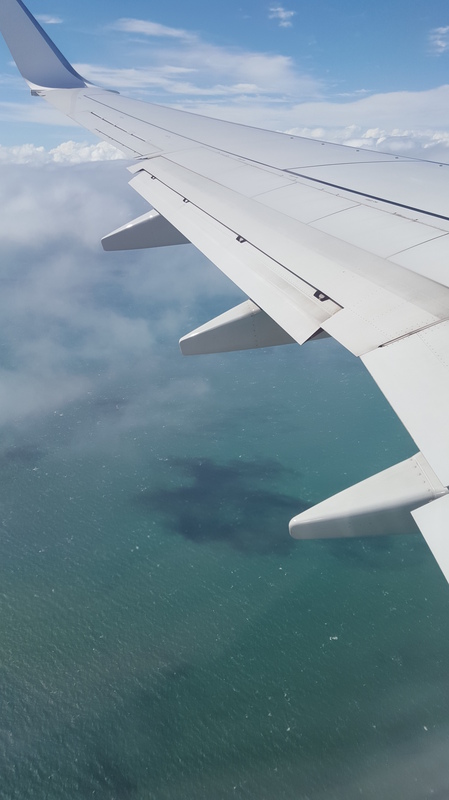 While we had been getting our suitcases, our tour company had notified us that our trip to the Great Barrier Reef was cancelled, due to weather. Really? No Great Barrier Reef?? We had originally booked with a smaller tour company so we walked into town to talk to one of the bigger tour companies. They were still running tours. Crisis averted! By this time we were starving! Not a lot was open, and what was open was serving more appetizers. 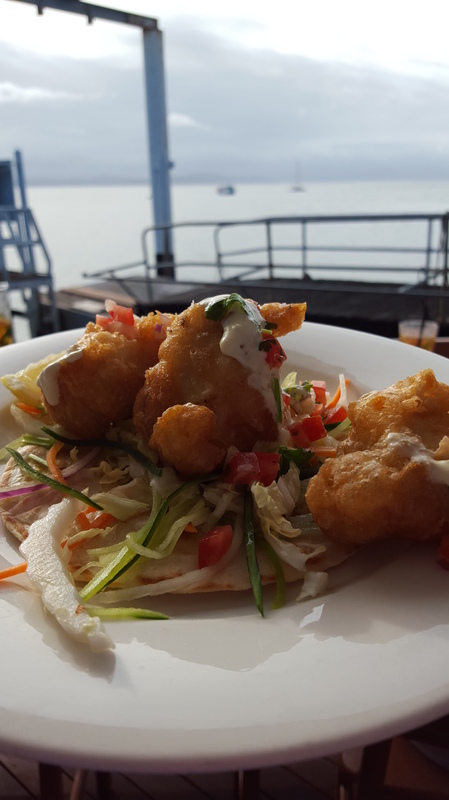 It was still delicious and look at this view! We spent the rest of the afternoon exploring Port Douglas before dashing back to our hotel before the rains came. We weren’t completely successful in avoiding the rains. And the rain, rain, rain came down, down, down in rushing, rising, rivlets. It didn’t appear that it was going to end, so we ordered pizza and watched my new favorite show – Master Chef. I had never heard of it before, but got totally sucked in. It may have had something to do with the Australian accents because I’m not sure I’d get that excited about the American version. Great Barrier Reef Day!! We walked over to the tour company and were told while we could go out today, tomorrow most likely would be the better. Well okay then. What to do today? Breakfast was the first order of the day. 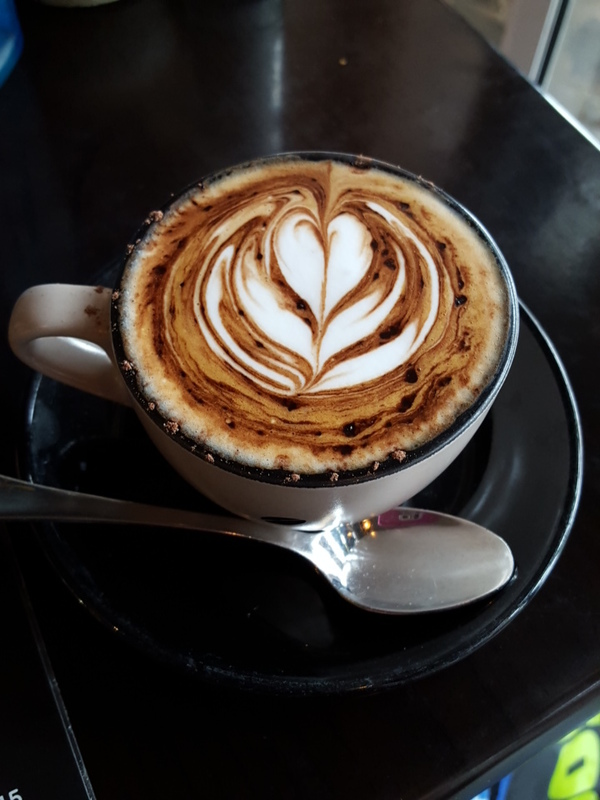 The coffee wasn’t quite as good as Melbourne, but the designs were still fun!! 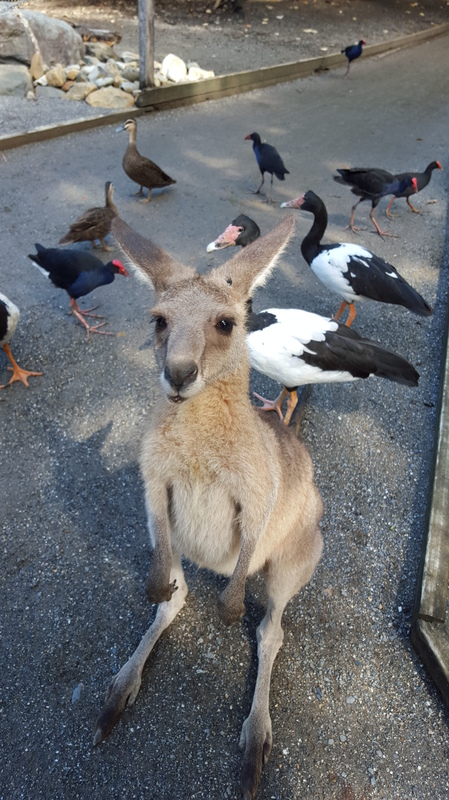 After a stop at the tourist information center, we decided to head over to the Port Douglas Wildlife Habitat. It ended up being a great idea! We got to hold a koala! I was slightly worried the koala would freak out, but he didn’t. Whew! 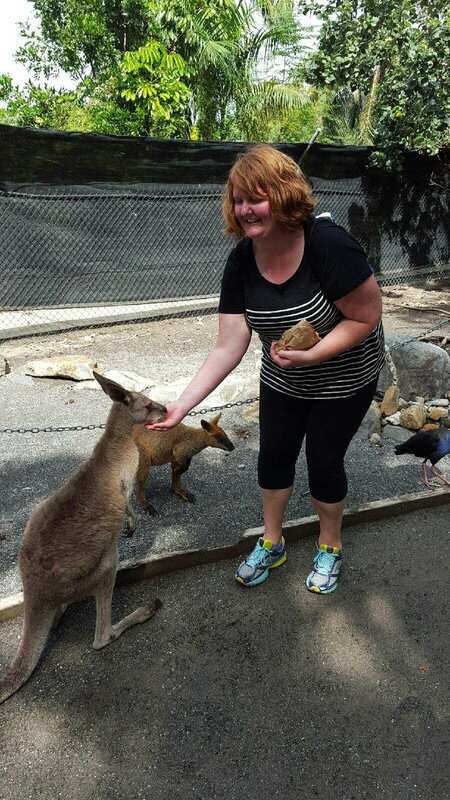 Our next stop was to feed kangaroos!!! But watch out for the ducks! They were super aggressive!! It was so much fun! Both a koala and a kangaroo? So cool! We headed back to town for lunch and spent the rest of the day wandering. Oh! And getting a Thai massage, which my body was so happy about. The rain started again so we high-tailed it back to the hotel to watch some Master Chef and order in food. Oh yes, we are party animals! Stay tuned for the Great Barrier Reef (did we or didn’t we?)!! 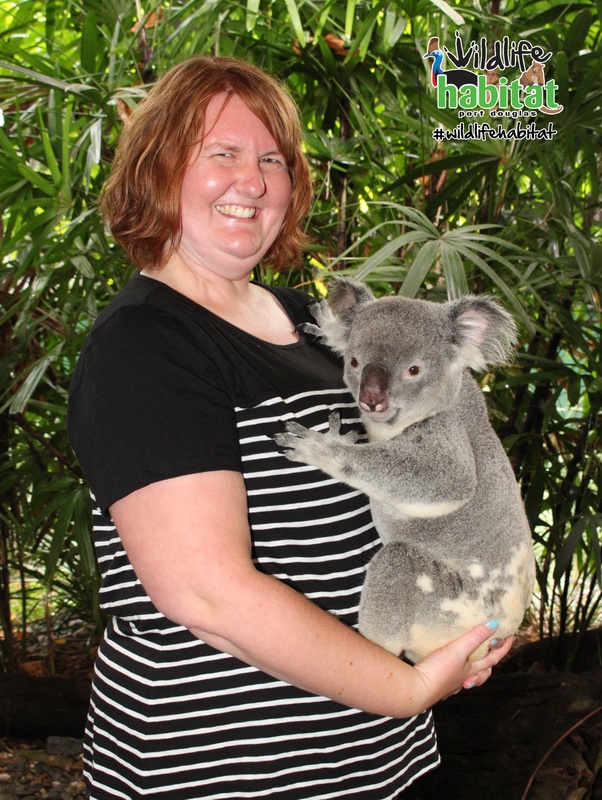 This entry was posted in Australia, Travel, Trip Report and tagged kangaroos, koalas, Port Douglas, Port Douglas Wildlife Habitat. Bookmark the permalink.